Altimeter & ABC watches can be a great way to reduce the number of items you bring with you when camping, hiking, etc. Hikers should not carry any more than 20% of their total body weight when backpacking or hiking. This is because the extra weight weighs you down, and prevents you from continuing on for longer. Because of this, many hikers might want to find a way to lower the amount of stuff they carry with them. This includes a compass, a map, shelter, tools, etc. Any way that you can reduce the amount of stuff that you drag along with you, the better. Plus, having all the tools in one piece of equipment makes it easier to access what you need quickly and efficiently. No more shoving your hands in your bag to fish out the compass and only find your car keys. This is why an ABC watch (Altimeter, Barometer, Compass watch) is a great replacement for potentially tons of stuff. This will allow you to better prepare for your upcoming grizzly bear fight. This is exactly what it sounds like: An Altitude Meter. It helps to find out what elevation you are currently at, which can be very helpful when you’re hiking, mountain climbing, or even simply because you’re a numbers nerd and like that information. It can even be very helpful for runners preparing for a race: knowing when you’re running uphill, even if it doesn’t seem like it, can help you plan your training way more effectively, especially for marathons and more serious races. Watches are generally able to determine this either by air pressure, GPS, or both. The further up you go, the less pressure the air exerts on you, allowing sensors on your watch to react accordingly, and thus estimating (accurately enough) the height of the terrain. Barometers are used to show Barometric Pressure, which is a great way to track weather patterns. When you’re out in the wild, this can help you to prepare for a storm that is coming. It also helps you to determine if a storm is going to fade soon. It works better than just sitting under a makeshift tent and not knowing when it is going to stop raining. It also makes it safer when you’re out hiking or hunting so that you can take precautions. Getting caught in a storm in the middle of nowhere is not a laughing matter. This is a great way to ensure that you don’t get lost. This is a great thing to have if you are in the middle of a forest or snowfield, and you forgot which way you were heading. It also helps to determine your altitude and works well with air pressure to do that. Using this feature, you can make sure that you have followed the route you intended, and it can help you plan future adventures. Plus, it’s always cool to have a summary after you’ve returned home. The main part of having a watch is to tell time, right? Well, the clock features can also change, depending on if it is an atomic clock, a GPS clock, or a clock with manual settings. Many altimeter watches come with a compass, which helps you to determine your current location as well as the way that you are heading. Some watches have a manual compass, while others have a digital compass. A manual compass is something that people need to learn how to use, especially when out in the wild. A digital compass can be more beneficial as it can tell you your direction regardless of where your wrist is pointing. This feature, along with the GPS, can be vital for a safe return after an adventure. While not too many watches have this function, it is a good feature to have. The Garmin Fenix 5X has this feature, and while it can help with people who can’t hike over certain temperatures, there are some issues. For instance, it does not take the heat of your wrist into account. While this can be irritating, it can be avoided. Just take off the watch, and wear it around your neck for a bit, and a more accurate temperature will be read. Battery Life is vital to your watch, as nothing is more useless than a dead watch. However, batteries come in a variety of types. Traditional, Solar, and USB charged. When you are out hiking, solar will probably be your best bet. The Casio PRW-6000Y is a good example of a watch that has this capability. Since the watch needs little electricity to power it, it does not need to be charged for too long. As little as 6 hours in the sun will suffice. However, solar powered watches can be a bit pricey, so it is great to determine your budget before you take out a second mortgage to buy one. The Garmin Fenix 5, Suunto Ambit3 Peak, and the Suunto Core Traverse all have a USB charging feature. While it may seem like a silly and trivial thing, buttons are not just a matter of appearance: a watch with larger buttons can actually be beneficial in many ways. For instance, if you ware wearing gloves, having a watch that you can still adjust while wearing them is definitely a plus. Larger buttons are just better anyway, as even without gloves, it makes it less of a shore to change the settings. Some of the types of glass that are commonly used on watches are better than others. The best type of glass that you should look for is mineral glass. Compared to plexiglass, which is generally used on watches, this type of glass is more expensive, but it is significantly less prone to scratches and other kinds of dings. The last thing that you should want is a several hundred dollar watch that easily scratches. Having a watch that breaks soon after you buy it is simply a waste of money. The materials used in its construction will be fundamental for its durability. For instance, finding a watch that has rubber straps on it will help you to keep your watch for a long as possible. They are also more comfortable and fit around clothing more easily. Leather straps are a classic on watches, but cheaper pieces tend to have fake leather that deteriorates fairly quickly; plus, leather straps need buckles or claps to adjust, and they might get rusty. Metallic bands are more uncomfortable for an active lifestyle and probably won’t look good for too long either. Like many of the others, this is not that important, but it is a nifty feature to keep an eye out for. The Garmin Fenix 5, for example, comes with this feature. A heart rate monitor can be a fun addition if you like tracking data, but it can also be a valuable tool if you use your watch as a way to assess your training. Especially when combined with the data you have obtained from the altimeter, you can check your performance in different altitudes and understand how to tweak your training accordingly. When it comes to Altimeter watches, there are generally two kinds. There are Traditional watches that come with the basic necessities, and then there are GPS watches, that have a lot more functions. Both of them can be useful, but it is good to find a watch that fits your lifestyle, so you do not pay more than you have to. Traditional ABC watches have the basic necessities. This type of gear generally comes with just an altimeter, a barometer, and a compass. Very little else is there, but it is generally a much cheaper watch as a result. For some hikers, this can be plenty. But for many others, you could probably use more functions. 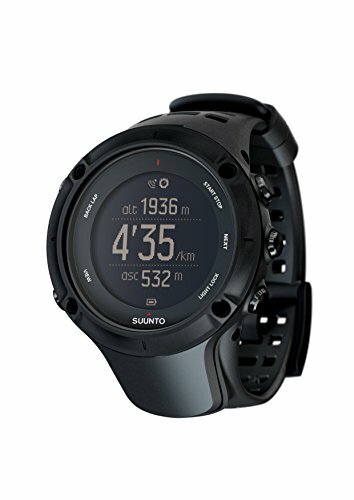 While this is not seen with every GPS watch, and every watch is different, these watches generally have these features. They can show your altitude, which can help when you are hiking or climbing. And, even if your GPS watch doesn’t have an altimeter, just the use of the GPS would allow you to find the altitude. Fitness features, such as a heart rate monitor, and even a step counter, can be seen with some models. Weather functions are available as well, so you get a more accurate representation of the coming weather. Many of these allow you to upload programs and games as well, although this is a minor feature, and probably should not be used on long distance travels, as it is a way to burn through your battery in a heartbeat. However, with all of these functions come a price. Not only are the more expensive, but they also use a lot more battery life than the more traditional watches. This is especially true if you are using the GPS function on your GPS watch. The watch life can be 8-50 hours, depending on many factors, such as power settings, so be aware of this. When it comes to the best features of this watch, the shining star (Pun unintended, maybe) would be the solar charged battery. This battery is a godsend to anyone who goes hiking, or pretty much any outdoor activities. Since you don’t have to worry about battery packs or charge times, you no longer have to fear a dead watch in the middle of a forest. So, based on this feature, and knowing Casio’s trajectory, I would dare say that this might be the best ABC watch available for those with simpler needs. It also has a power save option, which helps to increase the potential battery life. This can increase your power option by many hours. However, with the solar-powered battery, you may not need to use this feature often. No GPS function available. This can be a bit of a let down if you are trying to find a watch that will tell you exactly where you are. The temperature function is often off as well, but that is because your body heat messes with the readings, and it can be easily corrected by removing your watch for a little while, as we mentioned above. Still, the temperature is a nice feature to have. Another issue would be the automatic lighting feature. It turns on when it faces you, but if you press a button, it immediately turns off. This can be irritating if you want to adjust your watch in the dark. Route Navigation with the ability to track your path. You can get more features by downloaded Suunto apps, such as heat maps. The fitness features make this watch a great twofer, making it good for hiking, as well as simply tracking steps, speed, distance, etc. This is great for anyone who likes to calculate and utilize numbers. Its versatility might make this one the best ABC watch for weekend athletes and those who simply don’t want to sit down. It is also very customizable, which is good for anyone who wants the ability to add other features to their watch at will. 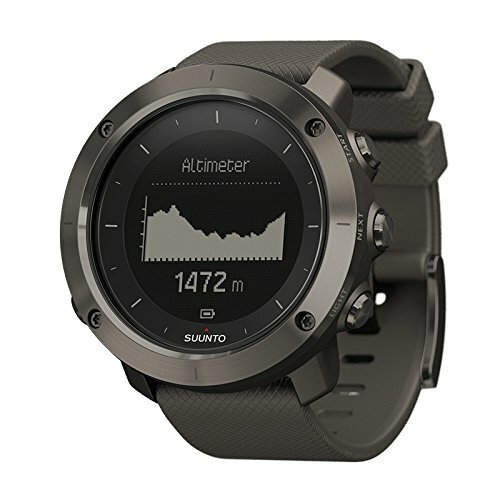 The Suunto store has a variety of apps to choose from, which makes having a watch like this interesting. The battery is lithium ion, meaning that once it dies, you will have to purchase a whole new battery. 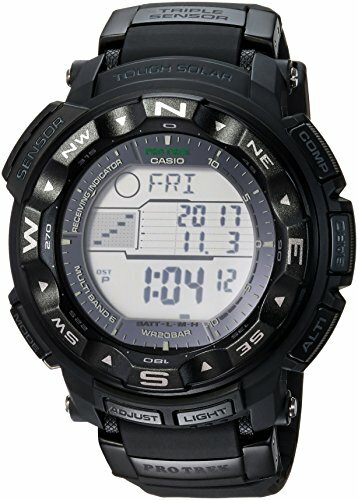 Sadly, it does not have the rechargeable features that watches like the Casio Men’s Pro Trek has. The battery does not last that long either, making it a pain when outdoors. 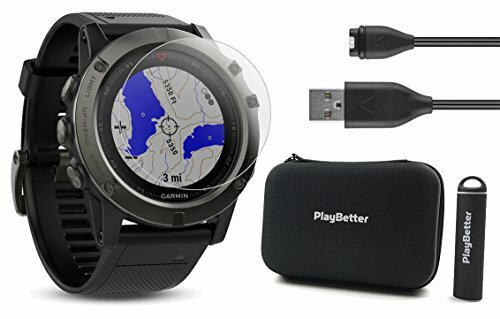 This watch comes with many cool and unique features, such as coming complete with a protective case, as well as a portable charger. With USB watches, power, while you are out and about, can become a serious issue. By having this portable charger with you, you can mitigate that issue by simply recharging your watch, even if you are hiking, or otherwise not home. Having that possibility means that you won’t need to choose which feature to use in order to save that bit of battery for the end of the trip. The tempered glass protector is also a great feature, as it prevents the watch from becoming damaged. Just place on the front of your watch, and reap the benefits. You can also pop off the band and add a new one, which is also nifty. These features really help your watch have a significantly longer life overall, which might make this option the best ABC watch if you’re looking for a piece to invest on that will last you years and years. The screen protector might not actually fit on your watch. This can be annoying, but it is not a necessary part of the watch. Tracks steps and even calories burned daily, weekly, monthly, and even yearly. This watch is great as it can double up as a fitness watch. With the ability to track calories burned, steps are taken, and speed, distance, etc, it can work as more than one device. This can give you more bang for your buck. It also shows weather patterns beyond a simple barometer. 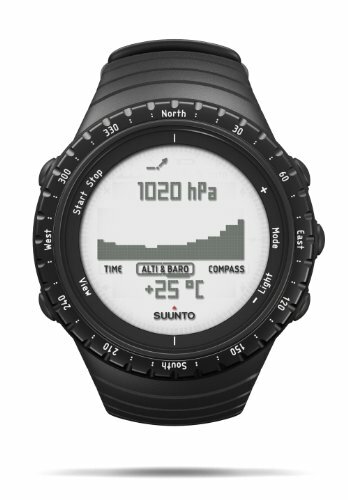 The Suunto Traverse can even alert you to incoming weather patterns, and inform you when it is time to find shelter before a storm. This might be the best ABC watch for the serious athlete. With so many features, it is not surprising that one main issue with the watch is that it can be fairly bulky, so bulky that it apparently uses a CR2 battery. They can also be incredibly pricey. At the time of writing this, they can cot as much as 450$ for a single watch. Granted, the watch is very high tech and comes with a ton of good features, but it can be out of reach for someone’s price point. Like with other watches, using any of the functions can quickly drain the battery life, and it can be a hassle to have one more gadget to charge. 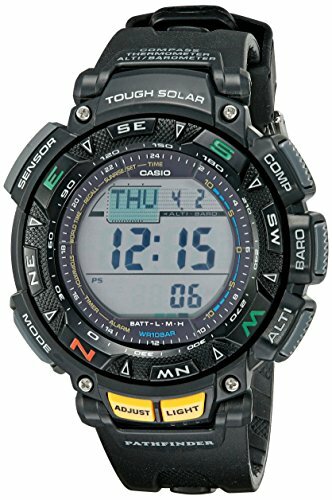 Like the Casio Men’s Pro Trek, this watch is solar powered, meaning that it does not need to have its battery changed or charged via a cable. This is very convenient and helps a lot when you are outside hiking or mountaineering. And it means that this watch will last you a lifetime, as Casio does anyway. It is also fairly slim, which gives it not only less weight, but a more comfortable fit. When you are hiking in the woods or mountain climbing, the less weight you can have on your body is best. Overall, this is a good piece for those who want a basic watch and a few extra features for when they are out and about. Nothing too fancy, but just enough to guide you and help you stay safe while still looking pretty cool. The main criticisms surround the watch’s glow in the dark feature. These are so small that many people have a problem even seeing them. Another issue is the price. As of writing this, the watch costs over 530 dollars, which can easily be far outside of anyone’s price point. However, if you are out and about often, that may be an investment worth having, as this is a piece that will surely last a long time. It is the only watch on this list that I read to be resistant to low temperatures. 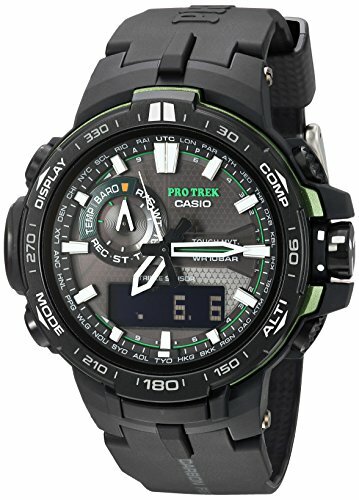 This resistance, along with the watch’s solar powered recharge and its water resistance, makes the Casio Pathfinder an awesome skier or snowboarding watch. As I have mentioned with the other Casio watches, the solar-powered feature is a huge plus. The fact that you don’t have to plug it in, or change the battery when you are out hiking or mountaineering, could sell this watch on its own. The compass feature can easily get dirt in it, which can cause it to stop working altogether. This can be rather irritating when you are lost and trying to find your way. The alarm function has also been known to be almost inaudible. Kinda pointless feature an alarm is if you can’t hear it. The display can be negative (black and white numbers, not emo or gothic) which makes it far easier to read in the dark. This can be beneficial because the backlight is awful. However, it is fairly cheap, so we can’t expect perfection. It is also very simple. No need to worry about a million different features when you only need a few. That can keep you from accidentally pressing on functions you don’t need. This makes it a great alternative for simple use at a fairly low price for a good brand. It uses a regular battery, meaning that there is no recharging it when the battery finally dies. Although the battery itself does seem to last for up to 12 months… if you don’t use any of the other features. This can generally be costly over the long term, as using any of the functions will obviously drain the battery much quicker than if you used it simply for timekeeping. It might be the best ABC watch for those who don’t plan on being out too often. When it comes to things you should watch for, many questions may come to mind. Why should I get one? If you want to consolidate your gear to include fewer items on your trip, than this type of watch is for you. It also takes the guesswork out of many things, such as weather forecasting, helping you in the long run. Who should get one? Pretty much anyone from hikers to skiers will benefit from having an Altimeter watch in some way shape or form. Some even have fitness features, to help you train, even when you are not on a hike. Pretty much anything from Garmin can be useful on that front. What can I afford? These watches can become pretty expensive, getting up to, if not over, 500 dollars for a single watch. The cheaper ones, however, can be under 200$. So make sure that you know your budget going into this, and see if you want to make an investment or go for the cheaper one. How often do you hike/climb/etc? One with fewer features would be best if you don’t go out often. These watches generally are designed to make life easier for people to hike or climb often. Am I going to use this short term or long term? This can help to determine not only your price but your features as well. If you are going to use it for long periods of time, and for a while, Solar batteries are the best bet to save on the cost of batteries long term. The best ABC watch that you should look out for is anything that is solar powered. Most Casio watches tend to be this way. This is because you don’t have to worry about the battery dying on you, as it is in a constant state of charge. Getting a watch that matches your budget, as well as the features that you need can be complicated at times, but it seems as if Casio and Suunto are good brands to look at when you are keeping an eye out for a good altimeter watch. I hope that you found this article helpful in your quest for the best ABC watch, and if you have any questions or concerns, feel free to contact us. After many email requests, we decided to add a little extra information for athletes and adventurers. How do I know which one to pick for my lifestyle? Just think about the main characteristics of your activities when deciding on the best ABC watch for you. If you’re going to be out in the snow, it’s good to have a watch that’s water resistant. It doesn’t need a waterproof rating for the deep sea, just good enough to survive a bit of melted snow. A strong band is important when you’re out and about so much. Any of the other features listed above, like the GPS and altimeter, are helpful, but the main thing is having a strong, resistant watch that will last you many seasons. You should focus on a high-quality face for your watch if you’re going to be up on the rocks often. The GPS and altimeter might be the most useful features for this sport. The step count, the GPS, and the speed trackers might be the most useful. An altimeter is also a great tool for runners as it allows further detail into their routes. A heart rate monitor might be a great extra to have, and some may find it to be a necessity. Water resistance is obviously the most important feature for a swimmer. A slim band will be better and more comfortable compared to a bulkier model. A barometer might be helpful if you’re swimming in the ocean or lake. You might want a calorie, distance, or speed tracker. The altimeter, barometer, compass watch really comes to play here, with all features being extremely useful. Battery life will be super important when you’re out in the wild. The GPS gives you an extra layer of safety on your trip.